The Insteon Smart Hub Pro looks gargantuan compared to the diminutive Lutron Caseta Wireless Smart Bridge Pro. 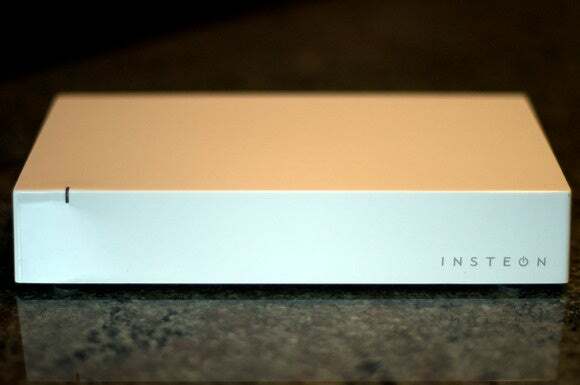 That’s partly because Insteon’s hub has an integrated power supply, and partly because the Insteon has two USB 2.0 ports (reserved for future use; they serve no function for the time being). Lutron’s much smaller bridge depends on a wall wart for power. If you have limited shelf space next to your router, you can mount the Insteon to the wall. But adopting Insteon’s HomeKit implementation means every member of your family will need to use an Apple device if they want to remotely control devices in the home. You can use Lutron’s bridge with either an iOS or Android device. This still being the early days of the connected home, not to mention HomeKit itself, I was pleased to find a bright orange card in the box with an 800 number offering tech support. That’s doubly good because the only documentation is a postcard with an illustration labeling the functions of the status LED on the front and the ports on the back; a QR code to help you download the software to your iPhone, iPad, or iPod touch; and the setup code you’ll need to configure the software. Does the presence of an integrated power supply and two-port USB 2.0 hub account for the much larger size of Insteon's hub, compared to the Lutron Caseta bridge on the left? Telephone tech support is available Monday through Friday from 5AM to 7PM, and on Saturday from 6AM to 3PM (Pacific time). Being relatively connected-home savvy, I didn’t think I’d need tech support—until I did. When I called on a Wednesday morning at around 10:30AM Pacific, a recording told me the approximate wait time was 65 minutes. Fortunately, Insteon gives you the option of leaving a call-back number so you don’t have to sit on hold. I received a call about 45 minutes later. In addition to the Hub Pro, Insteon sent along one plug-in dimmer module and one plug-in on/off module. 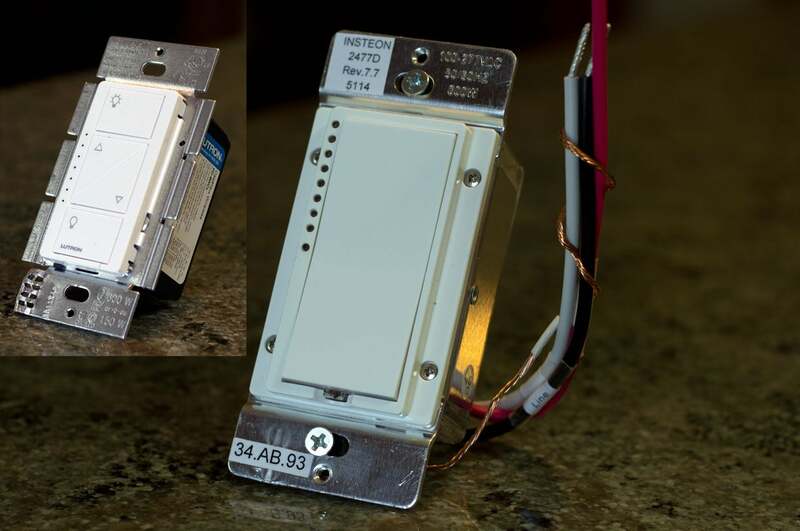 The dimmer supports two-prong electrical devices, while the on/off module can also accept devices that require grounding (the outlets are located on the bottom of the modules). Both modules have up and down arrow buttons on the right-hand side for manually controlling whatever is plugged into them. I had a second dimmer module from a collection of products that Insteon had sent me earlier, so I added that to my test suite. Even though the second dimmer was the same model as the first, adding it to the hub is where I ran into trouble with my installation. The Insteon tech-support rep who called me back delivered excellent customer service, patiently explaining the troubleshooting process and what he hoped to accomplish with each step. I didn’t inform him that I was a journalist evaluating the product, but the call lasted a full hour. Jot down the six-character code printed on the back of the plug-in module before you install it, because you'll need it during the installation process. After a number of attempts to pair the second dimmer with the hub failed, the tech had me perform full hardware resets on the dimmer and the hub—undoing everything I’d done before and during the call up to that point. “There are still some communication issues with the Hub Pro,” the tech said. “So there’s no guarantee that resetting it will solve the problem.” It did solve the problem, fortunately, but it also meant I had to start the installation over from scratch. Insteon’s dearth of printed documentation is somewhat ameliorated by its solid online documentation. Once you’ve installed the app and are ready to start enrolling devices for the hub to control, you’ll see a help button. Click on it and the app will provide some very useful information about how to proceed, but it would better if this information was available in some other form, so you didn’t have to toggle back and forth between it and the installation software, especially when you’re using a screen as small as a smartphone. Installing the Hub Pro is a simple matter of plugging it into a power outlet and hard-wiring it to your router. Insteon calls its technology “dual band” because it sends data both wirelessly (using unlicensed radio spectrum at 915MHz, not Wi-Fi) and over power lines (using a proprietary protocol, not HomePlug nor G.hn). 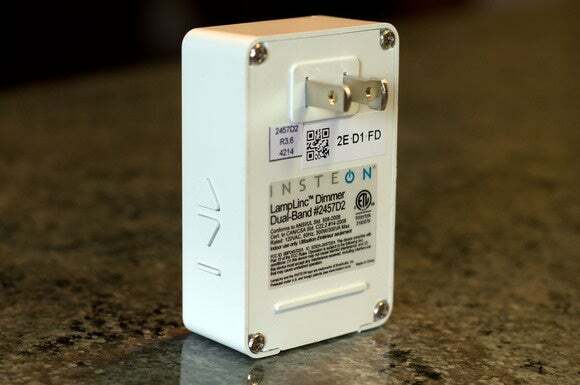 Because of the powerline aspect, Insteon doesn’t recommend plugging the hub or any devices into surge protectors or power strips, because those devices often treat data traveling over the line as noise that should be filtered out. 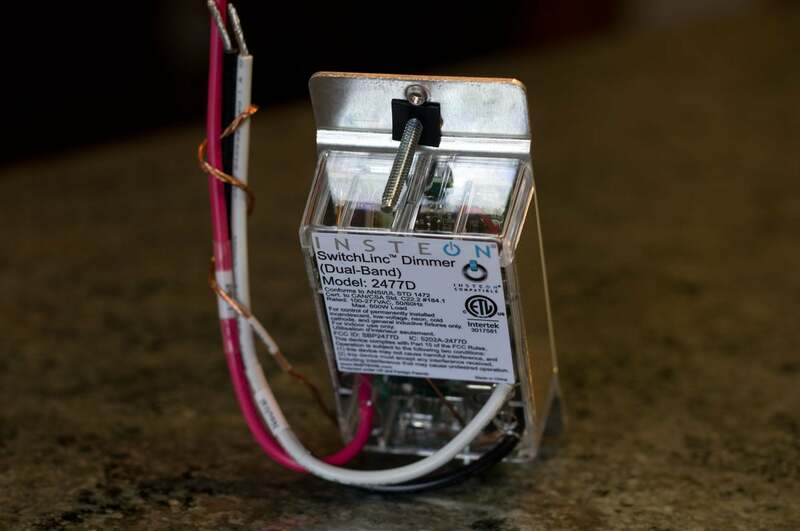 Each Insteon module can relay data to other Insteon devices to increase the network’s overall range. Once you’ve plugged in the hub, the next step is to enroll it into the Insteon+ smartphone app. Click “add device” and a radar animation plays on your screen while the phone searches for operating devices. 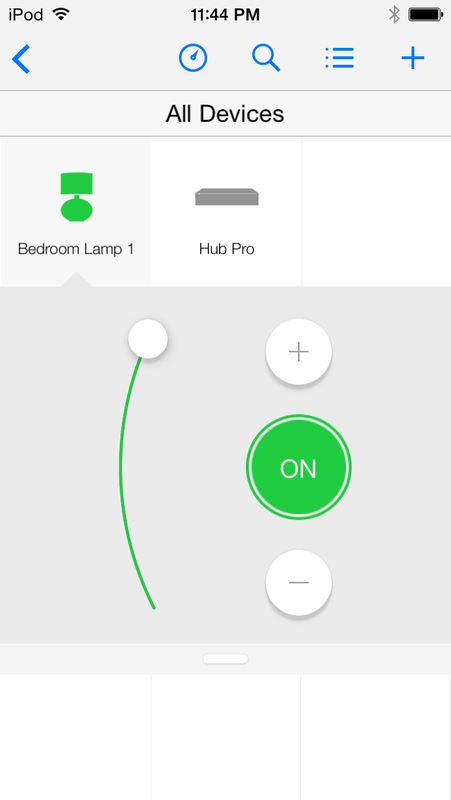 When the app finds the hub, click on its name to add it as the first device on the Insteon network. The Insteon in-wall dimmer's transparent enclosure appeals to the geek in me. With the hub installed, you use the same process to enroll the rest of your Insteon devices, one at a time, using the six-character identifier printed on the back of the device (suggestion: Jot it down a piece of paper before you plug it into the wall, unless you have a good memory for character strings). The dimmer and on/off modules Insteon provided deliver helpful audible and visual feedback to let you know when they’ve been added to the network: The module toggles to its off state and chirps to confirm enrollment. Despite the reassuring feedback from the device and from the app, there was a long delay before the dimmer began to respond to commands from the app, leaving me to wonder if it really was successful or not. One feature that Insteon provides that Lutron doesn’t, on the other hand, is an easy way to identify which device is which. Go into the app’s Edit mode, bring up the device you’re looking for, and click Identify. The device assigned to that name will chirp. Insteon is also to be commended for the huge variety of icons that can be assigned to each device—they have icons for everything from pendant lights to lava lamps to office chairs. I guess that somewhat makes up for the two-name confusion. Lutron's in-wall switches (inset) deliver better features than Insteon's do. Once you’ve installed a number of Insteon devices, you can assign them to Rooms and Zones to make it easier to control groups of them all at once. A Room can be whatever you want it to be, since it’s a concept and not a physical limitation, but most people will assign all the HomeKit devices in their home theater to a “home theater” room, all the devices in their master bedroom to a “master bedroom” room, and so on. Once you’ve done that, you can control all the HomeKit devices in that room with a single button press or Siri command, and you can program all the devices in that room to perform the same functions at the same times. The same goes for Zones, except these are groups of Rooms. Assign all the rooms in your second story to an “Upstairs” zone, for instance, and you can turn everything on or off in one fell swoop. You can do the same for all of your exterior lights, which you’d need to control with in-wall switches, which Insteon can provide. Scene controls let you set a number of devices too preset values. Scenes enable you to set selected HomeKit lighting devices to predefined values with the press of a button or with a single Siri command. I created one labeled “Romantic Dinner” that turned the light bulb connected to the On/Off module off and dimmed the two lamps connected to dimmers to 40 percent. You can create as many scenes using as many devices as you want, but you must select each individual device that you want to include in the scene—you can’t enroll an entire room or zone. 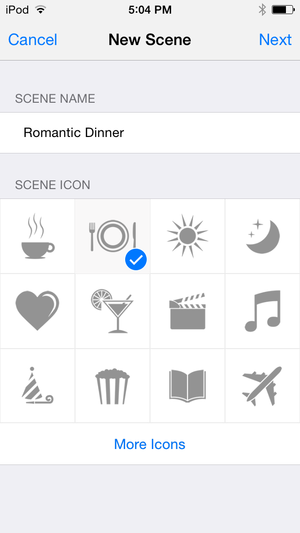 Here again, Insteon provides an impressive collection of icons that you can associate with each scene. Schedules are dependent on scenes, so you can’t create the former without first establishing at least one of the latter. Schedules do pretty much what you’d expect: You set the time and frequency that you want a lighting scene to occur. But time is limited to clock time (you can’t schedule lights to turn on at sunset and off at sunrise, for instance), and frequency is limited to daily, weekly, monthly, or never (for one-time events). Lights going on and off according to such a rigid schedule is a dead giveaway to a burglar casing your house that you’re using programmed lighting and that your home is actually unoccupied. It might seem backward for me to have discussed Rooms, Scenes, and Schedules before getting into individual device control, but you need to understand those concepts first. When you launch Insteon’s iOS app, you’ll see a single icon representing your home (the app can control devices in more than one home, too, which is great if you own a vacation home or if you want to program your parents’ home). Anyway, click on that icon and you’re presented with an icon labeled All Rooms. Click that icon, and you’re presented with icons for each of the rooms you’ve created and yet another icon labeled All Devices. Tap that and you’re finally presented with icons for each of the Insteon devices you’ve installed. Tap a room name, and you’ll see only the devices associated with that room. Insteon's touch-screen app lets you control the dimmer's output or turn it on or off with one touch. Insteon wisely provides a second means of navigation that doesn’t require so much drilling down to get to individual device control. Tap the Home icon to get to the All Rooms level and you’ll see a row of smaller icons at the top of the screen. Tapping the speedometer icon brings up a screen labeled Dashboard that’s divided into three sections: At-A-Glance, Favorites, and Scenes. You can control what appears in the At-A-Glance and Favorites sections, but all of the scenes you create will appear in that section. You can also choose which of the three sections will appear. At-A-Glance shows the status of all your lights and devices, any security devices (locks and what have you), your thermostat, and any schedules that you’ve programmed. You can designate any devices as Favorites and they’ll appear here. This would be useful for lights that you turn on and off frequently. Scenes, of course, are self-explanatory. However you navigate to the level to control an individual device, the appearance of the on-screen controls will vary according to the device type. For a simple on/off controller, you’ll see a large circle reporting the state of the device—with either the word “Off” inside a gray circle, or “On” inside a green circle. This is bordered by two static circles with the words “On” and “Off.” You can control the light by touching any of those three buttons. The user interface for controlling dimmers has a similar design, with the addition of a vertical slider that you can drag with your fingertip to control the bulb’s brightness. The two smaller circles bordering the one reporting the light’s status have plus and minus symbols and do the same. Here again, you can control the light using any of the icons. Should you buy Insteon’s HomeKit hub? Insteon has been in the connected-home space for a very long time, and it has one of the deepest product catalogs you’ll find. But only a fraction of that inventory currently works with its Smart Hub Pro, so that advantage isn’t as strong as it seems. The current lack of support for thermostats, smart locks, and security cameras is particularly disappointing (Lutron is also weak in this area, although it does support thermostats). The hardware that is supported is not as elegantly designed or precisely manufactured as some other connected-home products that I’ve seen (Lutron, in the HomeKit space, and Leviton in the Z-Wave market being two examples). 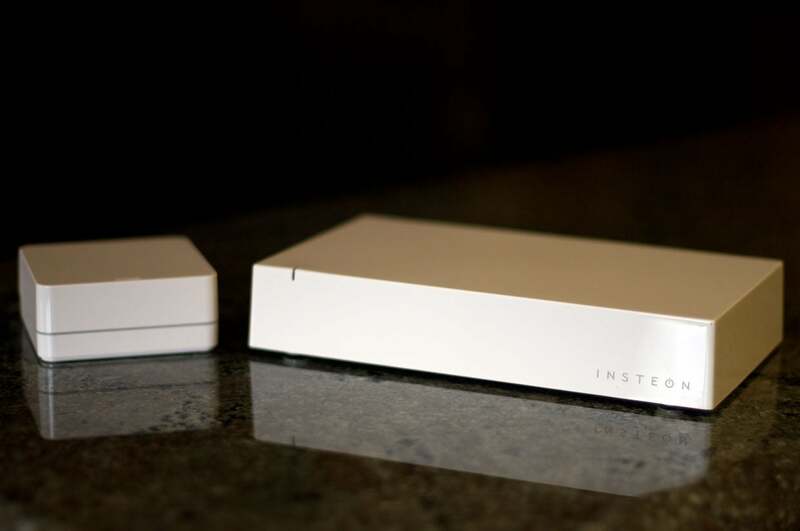 Insteon is closer to Jasco in the way its hardware looks and feels. Telephone tech support would be another Insteon advantage if you didn’t have to wait an hour to speak with someone (as knowledgeable and helpful as that person turned out to be). I do like Insteon’s software. While not as pretty as Lutron’s app, it’s more responsive and the dashboard feature provides a quick means of controlling some lights and all of your programmed scenes. The bottom line is that neither Insteon’s nor Lutron’s HomeKit systems are great connected-home systems. They aren’t bad products, either, but Lutron’s is slightly better. If you’re itching to build out a connected home Apple’s way, that’s the one I recommend for now. It’s very early days for Apple’s HomeKit technology, but if you’re ready to take the plunge, Insteon’s Smart Hub Pro and its product family falls just short of the competing solution from Lutron.